The small town of Tad LoLocated just outside the city of Laos Pakse, During the plateau Bolaven Plateau, encloses a so powerful as a beautiful natural place: falls Tad Hang. With a fall of 10 meters of water in its upper part, this corner of the Tad is the perfect place to eat and take a dip in its waters. In the South of Laos, near the border with Cambodia, Mekong River creates an infinite number of small islands, some inhabited, passing this area called Si Phan Don is popularly known as the Mekong 4000 islands. A peaceful and quiet place where life goes on the banks of the Mekong. The 3 most famous islands Si Phan Don (the Mekong 4000 islands) are: Don Khong the biggest island of all and 2 small islands very close to the one from the other, Don Det and Don Khon Island. Popularly known for its water falls and Irrawaddy dolphins, this haven of peace along the mekong in the form of island to the South of Laos has a special charm. The most popular animal Si Phan Don It is the Irrawaddy dolphin, conmunmente called the Mekong River Irrawaddy dolphin. These freshwater dolphins are named in honor of the Irrawaddy River (Irrawaddy) located in Burma, and although they also live in other parts of Southeast Asia, are frequently spotted in the waters of the river Mekong between Laos and Cambodia. One of the most visited parts of southern Laos is Si Phan Donknown as the Mekong 4000 islands. 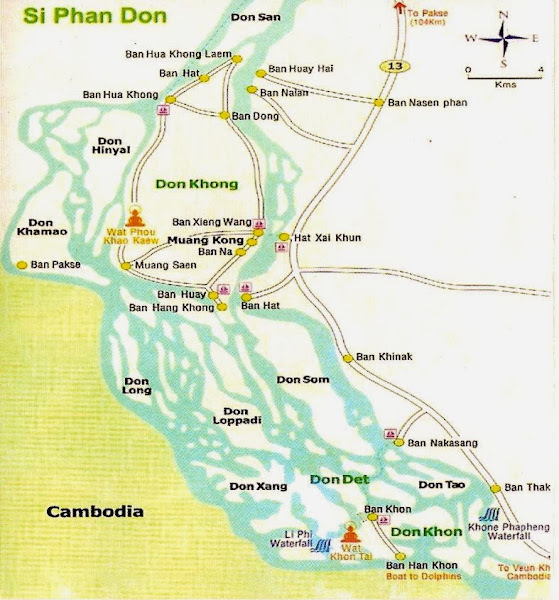 The most important islands of Phan Don is Don Khong Island, the island Don Det and Don Khon Island (without the g at the end). Somewhat confusing and complex transportation because of the mekong River, here you have a map of Phan Don in order to guide you, and find the most beautiful corners of the 4000 islands of the Mekong. In the province of Saravanh, in the plateau Bolaven Plateau the small village of Tad Lo is sprinkled by water of 3 falls that are to your around, among these water falls are the falls of the same name as the village, the Tad Lo waterfalls. 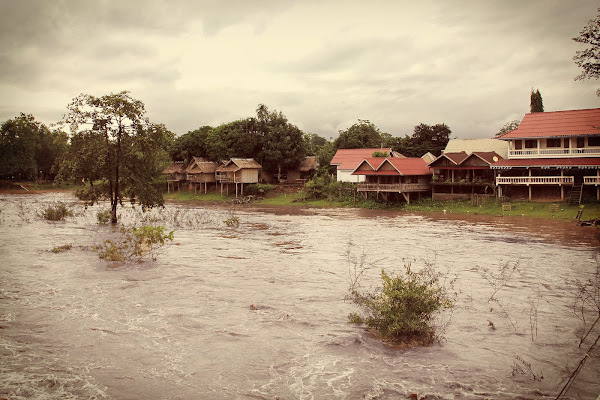 The small village of Tad Lo, in the province of Saravanh, is a small corner of southern Laos that although little tourism, is very popular with backpackers. The reason for the popularity of the Tad is simple, 3 impressive waterfalls of the area: the Tad Lo waterfalls, Tad Hang and Tad Suong. One of the most unusual tourist attractions in Phan Don (the Mekong 4000 Islands) is the old French railroad locomotive, situated on the island Don Khon. It's a small exhibit outdoors in the history of the railway in Laos, where only is exposed to steam locomotive and the remains of the train tracks. One of the biggest attractions of the 4000 islands of the Mekong in southern Laos near the border with Cambodia, are the Khone Phapheng falls. It's a water falls with a length of almost 10 kilometers, which becomes the largest waterfall in Southeast Asia to Khone Phapheng.